Are you looking for a pipeline control system with low total cost of ownership, applications that provide improved operational safety, and a pipeline modelling suite with excellent change management tracking and the ability to adopt to your own work-flow practices? If so GE’s Flow Safe Pipeline control system may be the product you are searching for. Pipeline System Expansion: The current SCADA systems are at capacity and cannot support significant SCADA growth to support business expansion. Flow Safe Pipeline is a powerful and scalable solution platform with the architecture and capacity to support major expansion of SCADA points, communications infrastructure, user consoles, and more. Limited Integration Capability: The current SCADA systems cannot easily support both standard off-the-shelf and custom interface. Flow Safe Pipeline offers a strong enterprise integration and provides support for common interfaces (such as OPC and ODBC) and corporate application interfaces, along with a broad portfolio of mature third-party interfaces. Secure, accurate, and easy-to-navigate, GE’s Flow Safe Pipeline is a finely integrated suite of applications for planning, monitoring, and controlling liquid and gas pipelines. The applications work together seamlessly to simplify use and streamline operations, while dynamic displays help pipeline operators visualize conditions more clearly for optimum safety and efficiency. Shared applications across the gas and liquid pipelines, such as: pipeline SCADA, historical information system, report generator, interface to dynamic dashboards. Applications specific to the liquid pipeline business, such as: flow path verification, tank processing, disturbance data collection, pump optimization, and others. Interfaces to batch scheduling system, corporate ticketing system, and hydraulic pipeline model. Applications specific to the gas pipeline business, such as: AGA calculations, short term load forecasting, vendor flow comparison, gas day accounting, natural gas availability and priority, and others. The Flow Safe Pipeline advanced pipeline management and control system application servicers are designed to run on either Windows or Linux operating systems. The system architecture is compatible with standard off-the-shelf computer and network equipment to align with your IT architecture policies and organizational expertise. Standard Application Programming Interfaces (API’s) are also provided, so you can upgrade your system with new Flow Safe Pipeline releases while retaining your investment in any custom applications. Common industry interface and SCADA protocols are provided to support enterprise integration and SCADA communications requirements. All data from either third-party applications or from corporate information systems are seamlessly integrated with Flow Safe Pipeline, thus providing the operator with a consistent look and feel. Flow Safe Pipeline’s User Interface and pipeline SCADA management applications are designed so that your users can operate the pipeline system in a safe, confident, and intuitive manager. The powerful and flexible user interface allows you to design and implement displays, alarms, and operator instructions consistent with your operating practices, and compliant with Operator Interface standards. 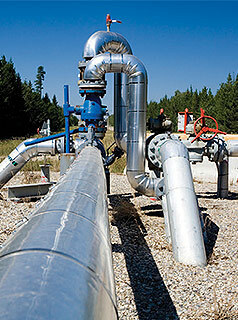 The pipeline SCADA management applications are designed with the flexibility to be configured for your communications requirements, conversion and display of field data, setting limits, acknowledging alarms, and performing other operating procedures in the same manner that you do today, supporting the implementation of best practices of operating procedures as required by your business. Our Security Solution takes best practices from the leading standards authorities and integrates them into our comprehensive, layered approach to security that provides a solid defense–in-depth strategy. Adopting our Security Solution makes compliance to regulations much easier to achieve. Comprehensive training courses have been created to meet the specific needs of our customers. We offer a complete curriculum for engineers, developers, administrators and end users of the Flow Safe Pipeline. In addition to the scheduled classroom offerings at our state-of-the-art Redmond Washington training facility.